The great SECRETARIAT was syndicated by Seth Hancock to stand at Claiborne. The longest period of leadership in Claiborne Farm’s history is that of Seth Hancock. Seth was 23 when Bull Hancock died, and although the father’s will pointed toward joint leadership with outsider supervision, matters soon worked their way out for Seth to be in charge. Seth had attended The University of the South and The University of Kentucky and brought an agriculture degree to what was intended as a lengthy course of working in various divisions of the farm. His father’s death hastened his term of leadership. That this soft-spoken young man had a full measure of the family’s savvy was indicated when he purchased Judger from his father’s dispersal. The colt raced for Seth’s Cherry Valley and won the Florida Derby and Blue Grass Stakes. Then came Secretariat, a colt bred by Christopher Chenery, a longtime associate of Bull Hancock. Chenery’s daughter, Penny Tweedy, was leading the family through its transition and the two-year-old champion Secretariat seemed poised for greatness. The financial situation, estate taxes, etc., called for a solution and the young Hancock stepped up as his father would have and syndicated the horse for $6 million, an astounding figure at the time. 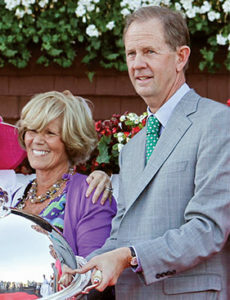 Seth Hancock (right) with long-time partner Adele Dilschneider (left) after Champion BLAME’s victory in the 2010 Whitney Handicap. Bull Hancock had famously converted Claiborne’s market-breeder business plan of his father’s day. Bull preferred to race homebreds rather than sell yearlings, and he had devised a plan to sell half of each crop to William Haggin Perry, the horses to be raced in separate stables but then co-owned after their racing careers. However, in his evaluation of what would need to be done in the event of his death, Bull Hancock expressed the wish that Claiborne return to selling. Seth was very much like his father in stating frankly that he did not regard himself as particularly good at selling yearlings. Nevertheless, he quickly compiled an impressive resume. Among the last yearlings bred by Bull Hancock was the Bold Ruler colt to be named Wajima. Seth sold him at Keeneland for $600,000, a record at the time. Another was the Sir Ivor filly which would be named Ivanjica, that brought $180,000. Wajima became the champion American three-year-old of 1975, and Ivanjica won the Prix de l’Arc de Triomphe. Development of stallions recruited to stand at Claiborne was a hallmark of the careers of A. B. Hancock Sr. and A. B. Hancock Jr. Of course Seth followed suit in many cases, but he also bred colts destined to be major stallions at other farms early in his tenure. In 1978, his Claiborne consignment included a little Northern Dancer colt from Special, she of the revered Claiborne family of Moccasin, Ridan, etc. 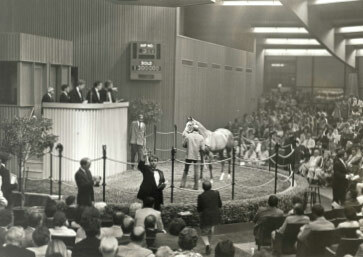 The colt sold at Keeneland for $1.3 million, at the time the second-highest price ever for a yearling. Named Nureyev, he became a high-class race horse abroad and settled in at Walmac Farm to prove himself among the best sons of Northern Dancer. Nureyev sired more than 125 stakes winners, including two-time Breeders’ Cup Mile winner Miesque, Arc winner Peintre Celebre, and Eclipse Award winner Theatrical. Champion and Leading Sire NUREYEV was bred and raised at Claiborne. He sold as a yearling for $1.3 million in 1978. Another major development on the international stallion scene was Caerleon, a Nijinsky II colt bred and sold by Seth Hancock. Caerleon was purchased at Keeneland by Robert Sangster, and won the French Derby before a stud career that accounted for more than 100 stakes winners, including English and Irish Derby winner Generous and Arc winner Marienbard. Caerleon was twice the leading sire in England and Ireland. 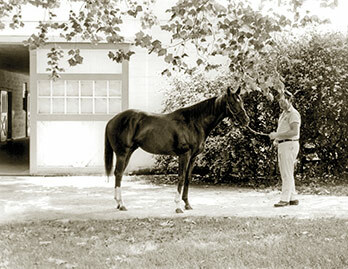 Further, Seth Hancock had a role in the breeding of Sadler’s Wells, the great Northern Dancer stallion whose dam, Fairy Bridge, was bred by Claiborne and sold to Sangster for a modest $40,000. Like his father and grandfather, Seth Hancock wielded influence in ways that did not always put his name down as a breeder. It was he who suggested to Ben Castleman that he send his mare My Charmer to the modestly-priced Claiborne stallion Bold Reasoning. The result was Seattle Slew, which brought only $17,500 as a yearling, but became a Triple Crown winner and highly important stallion. Among the sons of Seattle Slew was Swale. Seth Hancock reached a milestone for Claiborne Farm, his mother, family, and a partnership, when Swale carried the Claiborne colors to victory in the 1984 Kentucky Derby. The homebred was from Tuerta, which had won the last stakes Bull Hancock had seen won by a Claiborne horse. There was an oft-told story about how disappointed Bull had been the day Tuerta was born, for he had badly wanted a colt. Nevertheless, it was Tuerta which produced the colt that would fulfill the long cherished dream of winning the Kentucky Derby. The euphoria was short, for soon after Swale added victory in the Belmont Stakes he collapsed and died. It was obviously a shocking personal sadness, and to have such a sire prospect suddenly denied his opportunity potentially created a loss that could not be measured. Swale was voted the champion three-year-old and his earnings helped Seth Hancock click off another achievement of his grandfather and father, that of being leading breeder. Claiborne-breds topped the list with earnings of $5.5 million in 1984. Four years after Swale, Claiborne seemed to be on the classic trail again with Forty Niner, son of the farm stallion Mr. Prospector, from the same female family as the Derby winner. Forty Niner was the champion two-year-old of 1987 and went for the Derby the following spring. He closed well, established that he could stay the distance, and fell short by less than a half-length to the filly Winning Colors. Forty Niner did win the Haskell and gave Claiborne its first win in the Travers. 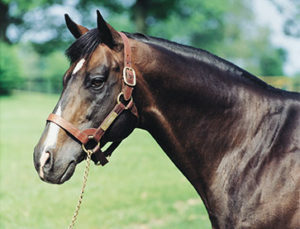 Forty Niner was one of 10 champions bred by Claiborne under Seth Hancock. In addition to having strong influence on the breeding of future stallions, Seth Hancock added his own chapters on his father’s and grandfather’s knack for acquiring future stars. Mr. Prospector, sire of Forty Niner, was an unusual case. He had originally gone to stud in Florida and was doing well enough to attract the attention of Kentucky farms. The young horseman Peter Brant suggested he might qualify for Claiborne, and Seth arranged to add the horse to the Claiborne roster. Mr. Prospector sired 182 stakes winners, led the sire list in 1987 and 1988 and topped the juvenile sire list in 1979 and 1987. He then moved up to top the broodmare sire list for six years (1996-2001). There had been some doubt early about Mr. Prospector siring winners at classic distances, but his Conquistador Cielo helped chip away at that with a 14-length win in the 1 ½-mile Belmont Stakes in 1982. Mr. Prospector also accounted for winners of the other Triple Crown races, Tank’s Prospect in the 1985 Preakness and Fusaichi Pegasus in the 2000 Kentucky Derby. Conquistador Cielo underscored the way finances of the breeding industry had soared, and thus how much Seth Hancock had to adjust. Barely a decade after the $6 million for Secretariat had created headlines, here he was syndicating a horse for six times that amount. The $36-million deal topped the previous international record of $30 million for Storm Cat, and for Seth broke a personal record, the $20 million deal for Spectacular Bid. Conquistador Cielo, the $36-million stallion, sired Jockey Club Gold Cup winner and Hollywood Gold Cup winner Marquetry among 69 stakes winners. Mr. Prospector’s numerous important sons at stud also include Fappiano, Woodman, Seeking the Gold, Miswaki, Gulch, Gone West, Kingmambo, Machiavellian, Conquistador Cielo, and Afleet. Forty Niner himself sired Belmont Stakes winner Editor’s Note and Travers winner Coronado’s Quest, et al, before the opportunity arose to sell him to Japan for $10 million. Seth accepted. Around that time, he arranged for another Mr. Prospector line stallion to be moved to Claiborne. This was the Kentucky Derby and Breeders’ Cup Classic winner Unbridled, which had launched a major career at stud. He was a perfect addition for Claiborne, but died young. Danzig, the other sire who deserves to be recognized with Claiborne’s best, was a son of Northern Dancer. Along with Mr. Prospector, Danzig was a dominant influence in American breeding and beyond. The sire hardly fit the usual mold, however, of a potential Claiborne stallion, for he was not a stakes winner. Bull Hancock had taken a chance on such a stallion in Nantallah, who sired champion filly Moccasin. Danzig was trained by Woody Stephens, who also trained Swale, and was owned by Henryk de Kwiatkowski. The colt was brilliant in winning each of his three races, but could not be kept racing sound. Seth syndicated him for $2.8 million. The Danzig blood quickly became influential around the world, aided by a new trend which some breeders followed, of shuttling stallions from the Northern Hemisphere to the Southern Hemisphere so that they had two breeding seasons per year. Danzig himself sired 198 stakes winners, and his son Danehill moved to the top of the world list with 347 stakes winners. Danzig’s best offspring included Dance Smartly, Pine Bluff, Dayjur, Danzig Connection, Polish Precedent, and Claiborne’s homebred Lure, twice winner of the Breeders’ Cup Mile and a Hall of Fame inductee. 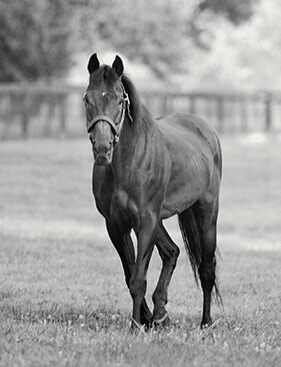 Danzig led the sire list for the first time in 1991. He also topped the list in 1992 and 1993 becaoming the first since Bold Ruler to lead the list for three consecutive years. Recently another son of Danzig, Claiborne stallion War Front, has soared to international prominence. Raised at Claiborne and winner of the Alfred Vanderbilt H.-G2, War Front has sired some 40 stakes winners and over half of them are Graded stakes winners, including G1 winners Declaration of War, Jack Milton, The Factor and Data Link. The latter also resides in Claiborne’s stallion barn. Blue Grass S. winner Pulpit, a Claiborne homebred, proved to be a very successful and versatile stallion. Pulpit died in 2012, but in addition to his 80 stakes winners and nearly 150 stakes horses, he also became a Sire of Sires. Son Tapit lead the General Sire list in 2014 and 2015. Another standout stallion is Arch. Bred by Helen Groves and Helen Alexander, Arch traces to the blue hen mare Courtly Dee. He was purchased by Seth Hancock and Adele Dilschneider as a yearling for $710,000, went on to win the Super Derby-G1, and retired to stud. He has four Champions to his credit, most notably homebred Blame. Blame was champion older horse of 2010 and punctuated his career by defeating the previously unbeaten Zenyatta in the Breeders’ Cup Classic. Blame combines the outside genetic resources of Arch with one of the key Claiborne families from his fifth dam, Rough Shod II. He, too, is a prominent young stallion at Claiborne. Another rising star at Claiborne is First Samurai, a spectacular two-year-old of 2005, when he won the grade 1 Champagne and Hopeful. The son of Giant’s Causeway also won stakes at three. He is the sire of Lea, a Grade 1 stakes winner who also placed in the 2015 Dubai World Cup. In addition, Kentucky Derby and Florida Derby winner Orb retired to Claiborne for the 2014 breeding season. Raised at the farm from longtime mainstays the Phipps family and Stuart Janney III, Orb is one of ten Kentucky Derby winners raised at the farm. The one-of-a-kind Gold Bowl awarded to Claiborne in 2003 represents the farm’s unparalleled success in Keeneland’s major races. Over a century, the masters of Claiborne Farm have faced many changes in the industry, but have succeeded while adhering to the best principles of stewardship of the land, the horses, and the sport of Thoroughbred racing. Arthur Hancock Sr. was faced with the abrupt demise of New York racing. Bull Hancock’s tenure included a phase when syndication became virtually ubiquitous and altered how stallion managers did business. In Seth Hancock’s 40-plus years, he too saw plenty of change. One was the creation of the Breeders’ Cup in 1984. As the plan was being developed, Seth gave it an important imprimatur by signing up the prestige of Claiborne to provide income from stallion seasons, a key source of Breeders’ Cup funding. Another major event was the passing of William Haggin Perry in 1993, ending a wonderful partnership. Since the mid 1990s, Mrs. Adele Dilschneider has become a partner and trusted friend for Claiborne Farm. Together they have raced a number of major stakes winners including Eclipse Champion and Breeders’ Cup Classic-G1 winner Blame, Grade 1 winner and top stallion Arch, and record-setting G1 stakes winner Lea. 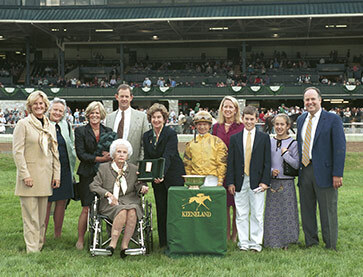 In addition, Mrs. Dilschneider was a partner in the filly Yell, whose victory in the 2003 Raven Run S. at Keeneland was historic. Claiborne Farm was awarded the one-of-a-kind Gold Bowl. The bowl represents the farm’s success in Keeneland’s major races and is a feat that only Claiborne has accomplished. In 2015, Seth Hancock stepped aside and his son Seth Walker Hancock Jr. took the helm. Walker is the fourth in a line of Hancock men who have guided and nurtured a major agricultural pursuit with steadfast integrity and dedication for what is good for the horse.